We have had a lot of nice rides over the past few weeks including the one with the breakfast riders group that was posted here a few weeks ago. We coved about 400km and it was a very sociable event. I will attach a photo in this post although not all riders are in it. We are having a ride tomorrow morning and I will attach Phil's email at the bottom will all the details. If you would like to be on the SMS notification then text or call me on 0429 912 189. Sorry about the late notice but I was waiting for confirmation that we could be relatively certain of a fine day to go riding. 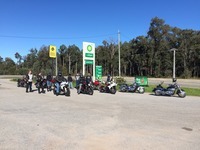 The ride planned for tomorrow will leave at 9.00am sharp from 45 Tranby Drive in Baldivis,6171 along Karnup rd, Hopelands RD to Pinjarra on to Waroona bakery for those wanting a pie or cake then the back road to Dwellingup on to North Dandalup, up the South West highway and disband at the old service station at the Jarrahdale turnoff. Please email back if you think you can make it so that I know how many riders to expect in the meantime ride safe.